Tag Archives: Paul Jackson Jr. Her seventh album, due September 18, is bolstered by collaborator Jeff Lorber’s R&B rhythms. 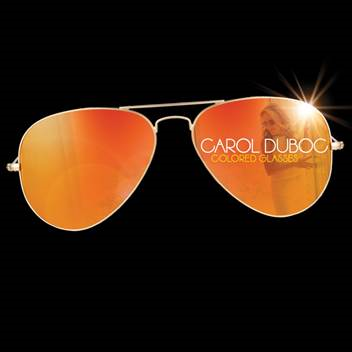 Los Angeles, California (30 July 2015): On Carol Duboc’s deeply personal 2013 release, “Smile,” the contemporary jazz singer-songwriter opened up in a way that she had never done so before, revealing the pain and heartache involved with dissolving her marriage while being the mother of a young daughter. She described writing the album with producer and jazz keyboards legend Jeff Lorber as therapeutic. Her therapy continues on “Colored Glasses,” a Gold Note Music ten-track disc written and produced by Duboc and Lorber set for release on September 18 and launched that evening with a Hollywood concert date that will be streamed online. Two years on, Duboc’s new material details her struggles with cutting the ties of the relationship, one tinged by her partner’s delusional view of the world. Writing lyrics and melodies to rhythm tracks sent to her by Lorber, Duboc addresses the realities and realizations of moving forward with honesty and candor, even if she felt her ex was hiding the truth behind “colored glasses,” thus spawning the album’s title. But she acknowledges her own role as well. Lorber’s R&B rhythms are lively throughout the soulful, sophisticated session of jazzy adult pop tunes. A marquee supporting cast brings high-caliber musicianship to the taut grooves with stellar performances by Jimmy Haslip (electric bass), Brian Bromberg (acoustic bass), Vinnie Colaiuta (drums), guitarists Paul Jackson, Jr. and Michael Thompson, Hubert Laws (flute), Eric Marienthal (sax), Lenny Castro (percussion) and multi-instrumentalist Lorber on keyboards, piano, bass and guitar. Dave Mann punches up several cuts with crisp horns and vivid horn arrangements that add vibrancy, lushness and depth. “Hypnotic” will be serviced to radio next month coinciding with the release of a video lensed on Venice Beach for the album’s “Wavelength,” a danceable guitar and horn-driven song about intuitive communication between partners. To mark the album’s release and celebrate coming through the other side of the relationship, Duboc will perform at the famed jazz joint the Baked Potato on the release date (Sept. 18), which will be streamed live on her website (www.CarolDuboc.com). Lorber, Haslip and Thompson are among the musicians from the album’s lineup already confirmed to be backing the singer that night. A native of Kansas City, Missouri, Duboc has been living in Los Angeles ever since she attended USC Thornton’s School of Music. Prior to launching her solo recording career in 2001with the critically-acclaimed “With All That I Am,” Duboc wrote hits on gold and platinum-selling albums, including records by Patti LaBelle, Chante Moore, Tom Jones, Stephanie Mills, Jade, Fine Yong Cannibals, Maurice White and the late George Duke. Possessing multimedia appeal, the photogenic blond had a supporting role on the silver screen in “Be Cool” alongside John Travolta, Uma Thurman and Danny DeVito. Additional information is available at www.carolduboc.com.